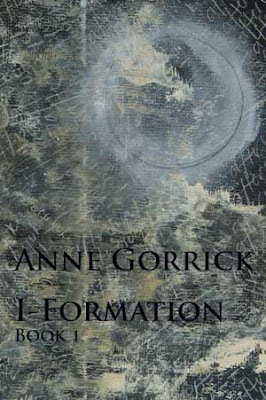 The cover of Anne Gorrick’s new book of poetry, I-Formation, is a photograph of an encaustic and pastel work by Gorrick herself, entitled “After Usuyuki,” which refers to Jasper Johns’ series of prints, “Usuyuki,” which consist of crosshatch marks on a grid-like surface. The image on I-Formation contains the text, “after Usuyuki,” handwritten over and over again in a crosshatch pattern across what appears to be a weathered surface. The print has some kind of screen or fabric texture embedded into the surface as well, and the piece is richly smudged and blurred. The image accurately captures the multi-layered pentimento-like density of the 87 pages of poetry within. The poet is working with language as if it were gardener’s soil: turning it, sorting out stones and setting them aside, deadheading, and letting blooms occur in unexpected places. Repetition, used elegantly, is key to this poem, and functions as a kind of sonic cross-hatching. Phrases and words might reappear several times, not at all chant-like, but in new combinations, as the poem composts and renews itself into organically hybrid phrases and lines. “Her Site of Reversible Destiny” is reminiscent of certain kinds of encaustics wherein layers and layers of beeswax of different degrees of opacity are fused together so that the artist’s intention is recorded, as it changes, and what a viewer (or reader) is left with is a kind of semi-translucent layering of versions and rewritings that cross (hatch) over the surface of time. This allows the reader to see how the poet’s mind works, making it a real delight, particularly for other poets, to read. The theatre of panic and panic itself. Leave things behind. Tree of indifference, tree of hope. The needling green, the complicated arms. And the sky, an exploited ruin, a paint can in the fire: char, rust, gas. Wax the cerecloth. Wrap the dead and place them up there to burn. She is a stagnant shape of wind. She is ancient movement trapped. Stand where the limb meets the trunk, back against the trunk as if looking out a window. There are monkeys everywhere, grey and familiar childhoods swinging around fat limbs, until one becomes trapped upside down and the others rescue it. A man says, “why don’t you try it?” She can’t. They must get down he says. They can’t. So they jump. She feels her pelvis disintegrate. She is in the grass now, smiling because she can’t believe she’s alive and recently fucked. —and she will tell you everything. I-Formation is an intelligent, lovely, strong book of innovative poetry, well worth the read. You can download a PDF sampler excerpt here, check out Tom Beckett’s review of the book here, and buy it here. Keep your eye out for I-Formation, Book 2, to be published by Shearsman in 2011. Lynn Behrendt is the author of The Moon As Chance, Characters, Tinder, Luminous Flux, and, soon to be released by Lunar Chandelier Press, petals, emblems. She co-edits the Annandale Dream Gazette, an online chronicle of poets’ dreams, as well as Peep/Show Poetry, an electronic publication of innovative contemporary poetry.